The Golden Anniversary Dinner in November 2010 brought back many past members of the Club as well as remembering a frighteningly large list who have gone to the great cave in the sky over the last 50 years. Geordie toasted absent friends after reading a list of some thirty or more missing members. 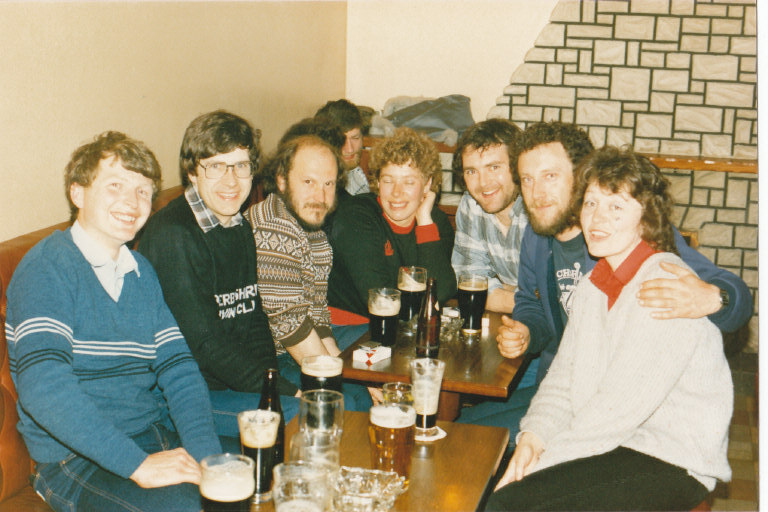 Along with members, there was another list of friends of the Club, cavers from other clubs and people such as the landlords of the Royal Oak and the Drum and Monkey who are also no longer with us. Many of these people are in the picture below taken at the Club's 25th Anniversary. However, it gave the webmaster the idea that past members, who are not current members of the Club and quite understandably do not want to renew their membership might like a bit of space on the website to recall the past and share anecdotes and pictures. This section is currently set up with a simple sort of bulletin board and a few photographs. It will be developed as demand and interest dictate. The idea is that anyone who was associated with the Club in the past can send in snippets of information and also pass on messages to other members. The website will accept and store email addresses but will not send them out to anyone, instead, the webmaster will, at his leisure, forward messages so as to protect past members' identity, if required. One of the ideas of these pages is to enable the records of the Club to be filled out with stories and details which may not be recorded in the newsletters. To this end, copies of newsletters can be sent to past members. Please apply to the Webmaster saying which periods you are interested in. If you just want to send a message, then there is a page where you can enter this. If we can, we will put people in touch with each other although we will never give out personal details such as telephone numbers and email addresses. If there are any other ways that the Club could help past members, do get in touch.